by Andy Higgs in Europe, Features, Germany, News, Places. 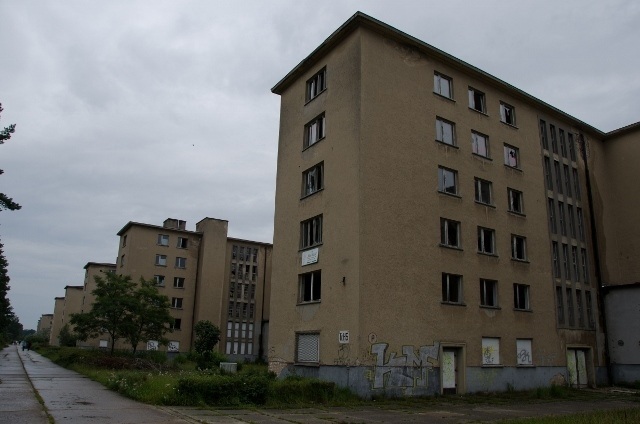 In a surprising turn of events this weekend, an entire 500 metre section of the planned holiday camp at Prora on the island of Rugen in Germany was sold for £2.2 million, some three times the asking price at a Berlin auction. After initially suspecting an April Fool’s Joke (the story was published on April 1) but failing to find any tell-tale clues, we were able to locate the auction catalogue online (see page 40) and confirm the sale. Apparently auctioneer Mark Karhausen had to deal with at least ten different bidders keen to get their hands on the huge building. The sale raises hopes for progress in making use of the immense ruins – already a vast youth hostel has opened in another section of the complex amid some controversy, but fears of neo-Nazis rushing to have a beach holiday there have proved unfounded. Locals, historians and politicians have clashed in the past over what exactly to do with the complex, which stands on one of Germany’s finest sandy beaches just up the road from the resort of Binz. The fate of the documentation centre which tells the story of the planned resort and offers tours around the ruins remains to be seen but it seems unlikely to close in the near future. The museum chronicles the history of Prora which, aside from the building of the Atlantic Wall of coastal fortifications stretching from Norway to the border of Spain – intended to thwart any Allied landings in occupied Europe – was Hitler’s biggest building project. What do you think about the sale? Should Prora be given a new life as a luxury resort, be converted into apartments or be left well alone as a monument to what could have been? Let us know in the comments box below!